The White House chief strategist has had a profound influence on Trump and, tragically for America, that influence will linger. An embattled Donald Trump mounted a sketchy defense of Steve Bannon at the start of the week, when reporters asked whether the president’s “chief strategist” had a part in the tone-deaf decision to suggest that there is some kind of moral equivalency between white supremacists, white nationalists, and neo-Nazis and those who oppose racism, xenophobia, and inequality. 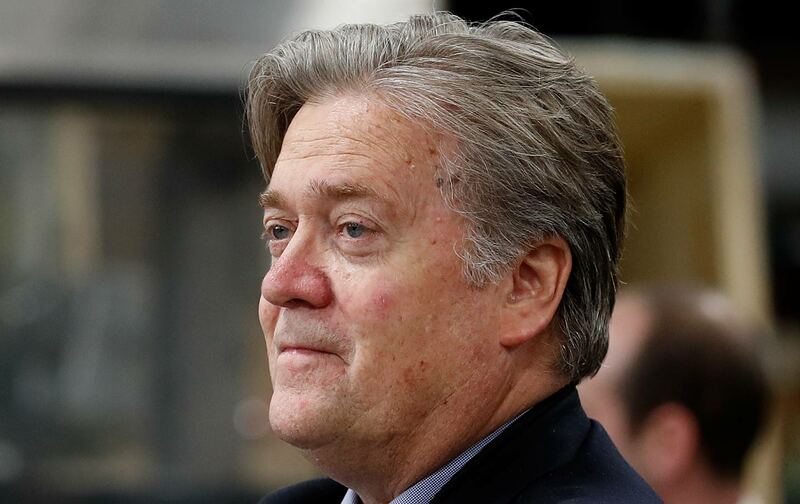 That’s a bit unfair to Bannon, who clearly influenced the Trump campaign from the outside during the billionaire’s run for the Republican nomination, and who played an defining role in keeping populist themes at the forefront of the fall campaign for which he served as the essential strategist. But if Trump wants to say that Bannon did not make Trump any worse than Trump already was, so be it. Then getting rid of Bannon means very little, aside from the fact that the man who made the conservative Breitbart website “the platform for the alt-right” will now be “unleashed” to pressure the administration from outside a White House where Bannon acolytes—especially senior adviser Stephen Miller and deputy assistant to the president Sebastian Gorka—appear to retain a good deal of influence. Bannon will also be able to defend another longtime associate of his, Attorney General Jeff Sessions. The reality, of course, is that Bannon has influenced Trump’s worldview. It would be difficult to overestimate the role the chief strategist played in making a New York billionaire into a crude economic populist who was able to appeal to disenfranchised and disenchanted voters in a number of battleground states. Bannon’s crude cynicism had a profound influence on Trump, giving the candidate the confidence to make appeals that were designed to inflame racial, ethnic, and religious differences. Trump entered politics as a reckless and irresponsible child of privilege who had a flair for the theatrical based on his experience with New York tabloids and his second career as a reality-TV star. He was unprepared to be the Republican nominee for the presidency, just as he was unprepared to be president. But Bannon recognized a shamelessness in Trump that could be exploited politically, and, with a handful of other associates of wealthy political financiers Robert and Rebekah Mercer (including Kellyanne Conway), engaged in that exploitation. Where does Bannon end and Trump begin? That’s a tough question. If what Trump says is true—that he needed no encouragement from his chief strategist to reach the conclusions that “very fine people” march with white supremacists—then the answer is inconsequential. Whatever Bannon taught, Trump learned. Case closed. But with Bannon gone from the inner circle—at least for now—there will be efforts by the Trump allies that the strategist identified as “globalists” to steer the administration in the more traditional direction favored by the many Wall Street insiders who populate another wing of the West Wing. So how should we measure the lingering influence of Bannon on the man he made president? The answer will not be hard to discern. Trump knows nothing of American history. In fact, he is so unfamiliar with the basic premises of the republic and its trajectory that he has relied heavily on Bannon and Stephen Miller to provide him with touchstones to reference. That’s how Andrew Jackson—a brutal and lawless president who preached a narrow populism while constantly abusing his authority to extend the slave power, violently displace Native Americans, and inflame regional divisions in the young United States—became the former president Trump most respects. As noted, Trump is a historical ignoramus. He needed a presidential reference point, and he took it from Bannon. For so long as this president keeps the Jackson portrait on the wall, and for so long as he keeps comparing himself with one of the worst presidents in American history, the voice of Steve Bannon will echo through this White House.